When Samuel Gentz looks at an old piece of wood, he doesn’t see junk. He sees treasure. Potential. A creative medium that takes a little finesse and love in order to repurpose it into something useful and beautiful. 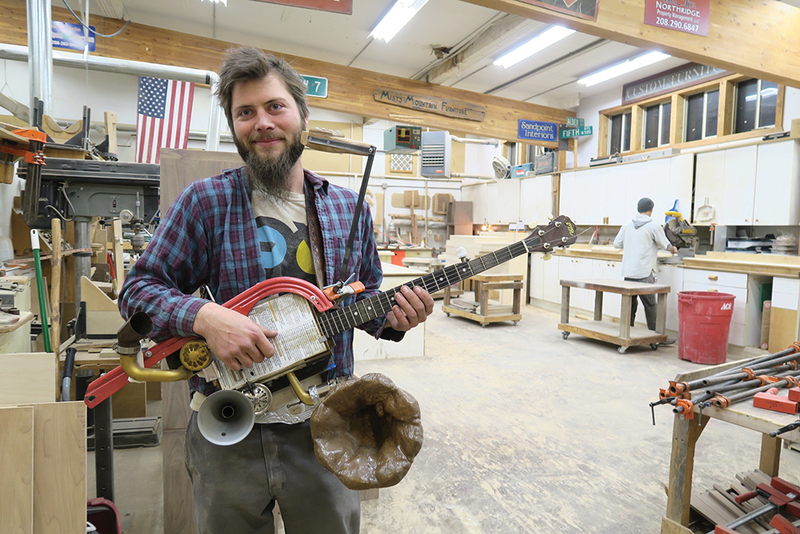 The Wisconsin-born woodworker first moved to Sandpoint with his family in 2004 when he was 16 years old, but he got his start in the shop much earlier than that. Samuel Gentz with his one-of-a-kind banjo. Photo by Ben Olson. Gentz said he first started working with wood when his grandparents used to babysit him before school. 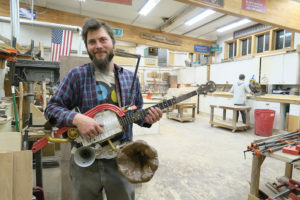 Gentz developed a keen interest for woodworking, which he turned into a career about five years ago when he was hired at rustic furniture shop Northwest Handmade in Sandpoint. “I worked there for two years for Dan (Mimmack) and learned a lot of good stuff,” said Gentz. It was after a friend mentioned Gentz’s creative woodworking to the owners of Misty Mountain Furniture that he was asked to join the crew on Fifth Avenue. Gentz currently works part time as shop manager at Misty Mountain, producing high-quality pieces of furniture utilizing his rustic, off-the-wall style that redefines itself with each new project. He creates unique pieces built to order as well as creative pieces that stem directly from his imagination. While each project offers a new set of parameters, Gentz finds the most joy in working with reclaimed, distressed materials. For a showing in ArtWalk last summer, Gentz produced several pieces that epitomized the nature of reclaimed work. One was a corrugated reclaimed bookcase, with old corrugated metal pulled from the Grainary and reclaimed wood used from an old mine. Another piece is a rustic coat rack made with pine that was blowtorched to bring out the old saw marks in it. Gentz added a vintage gold pan along the bottom to serve as an umbrella holder and wrapped a distressed piece of metal around the base both for stability and aesthetics. The end result is a coat rack that would be equally at home in a rustic cabin as it would a luxury lake house. Gentz said he enjoys hunting for materials just as much as producing furniture. One odd creation of Gentz’s is a banjophone, complete with vintage horns and sound boxes repurposed from old Gramophone record players. Gentz struck gold at a garage sale when he found three vintage Gramophone players for $20. Gentz said he always tries to go into a project with a plan, but leaves room for improvisations. Many of Gentz’s pieces on display at Misty Mountain speak to his unique style, with a combination of old and new wood, metal and leather pieces and other creative flair. He can take a 100-year-old pile of junk and turn it into a work of art. But it’s not an easy, quick process. “I’d say I spent about 30 hours on that corrugated bookcase, not including dreaming about it and putting it in AutoCAD and getting the wood,” said Gentz. Gentz said he utilizes the age old technique of trial-and-error for many of his projects, which often don’t have examples to pull from because they haven’t been done before. To view Samuel Gentz’s pieces, head over to Misty Mountain Furniture at 502 Cedar St. in Sandpoint or check out his Facebook page under Samuel Gentz.